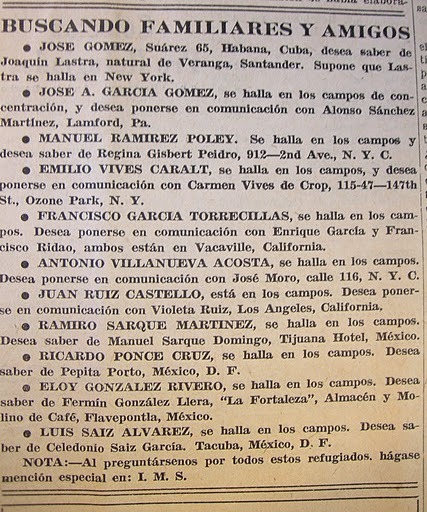 More heart-wrenching clippings from New York’s Spanish-language press, this time from the Brooklyn-based paper, Frente Popular. The war is over, and the international network of Spanish Republican immigrants and exiles is abuzz with desperate attempts to locate loved ones. Spaniards fleeing from Franco have been corralled into horrific concentration camps in southern France, and from behind the barbed wire, anxiously plead for assistance from friends in the international network of solidarity in the US and Mexico. After the Nazi occupation of France, thousands of these Spaniards would be sent to Nazi death camps, like Mauthausen and Buchenwald. Imagine coming across this news item in your local paper, as you sip a café con leche in your neighborhood hang-out on Henry Street in Brooklyn Heights, or on 14th Street in Little Spain, or on 116th St. in El Barrio, on a day just like today, in the Spring of 1939.